When manufacturers want to attach a gear, pulley hub, or coupling to the shafts of driving equipment, they generally use a keyway locking method. With this method, a key blocks shaft rotation and helps transfer torque. For this to work, different types of keyway cutting options are used to make a keyway in the shaft and coupling hub. This article will examine the most popular keyway cutting technologies used today. Do you want a Free Davis Keyseater Brochure? Keyway cutting with a keyseater machine removes material through a series of tooth cutting strokes. Some keyseaters only feature a single tooth cutter, while other machines (like the Davis Keyseater) use a multiple tooth cutter to achieve cutting speeds as fast as broaching. Here’s how it works: The cutter on the keyseater slowly advances outward with each consecutive cut. This subtle movement allows each stroke to remove a little bit more material. The process repeats until the cut is deep enough to meet the specifications of the coupling hub print drawing. The primary benefit of keyseating is that it offers great flexibility for large and specialty keyways. Custom sized tooth cutters are easy to obtain, and can also be quickly modified at an onsite tool room to meet unique specifications. However, depending on the type of your machine and cutting tool, keyseating may require a longer cycle time than traditional broaching. To get an idea of cycle time, view our chart that illustrates keyseater cutting times for various keyways and materials. Keyway cutting with a broaching machine is similar to keyseating. 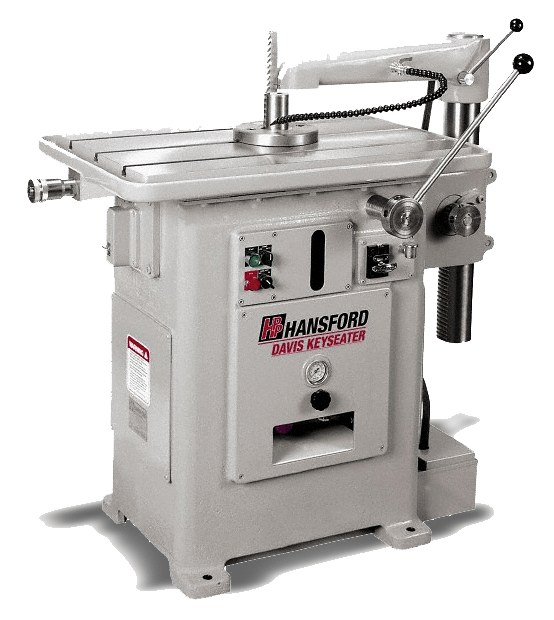 However, it’s more common for a broaching machine to feature a cutter with multiple teeth. Again, the cutter on the broaching machine is pushed through a hub and removes more material with each tooth the further it advances. Due to the multiple teeth, more material can be removed faster. Keyway broaching can usually cut a keyway in 1-3 strokes. One important characteristic to note is that broach cutting teeth, like other cutting tools, need to be sharpened when dulled. For more information on this, read our article on broach sharpening. Another characteristic is that broaching machines can be aligned horizontally or vertically to push or pull a broach through a part. One problem with broaching is the upfront cost of the broaches. They can cost up to tens of thousands of dollars and will require regular maintenance. Another issue is time. If a custom broach isn’t readily available, it can take weeks to months to manufacture the broach. 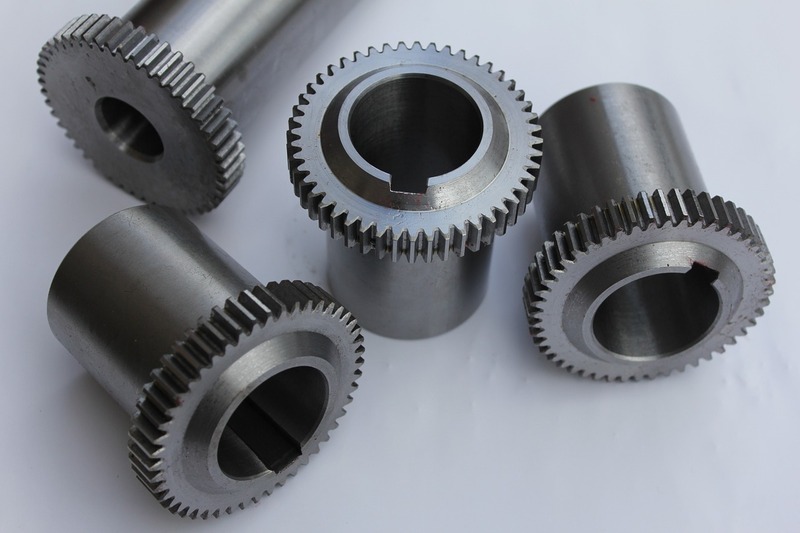 Keyway cutting with wire EDM (electric discharge machining) is generally used for small quantity runs that require precision or other specific cutting options. Tool and die builders use wire EDM to remove material through a method that might be described as “shock” or “evaporation.” In this method, a spooling copper wire is brought up close to cut a target with electrical sparks (but doesn’t directly touch the component). If you’re looking for speed, wire EDM is probably not your best keyway cutting option. A standard machine might operate at 12 square inches per hour. As an example, if your part is 6” thick, a wire EDM machine will cut 2” deep per hour. However, one redeeming factor to this is that wire EDM machines can run without an active operator. With that said, some applications best suited for wire EDM include: prototype parts, rush orders, and one-off requests. Shaping is a good option for cutting blind keyways. “Blind” refers to keyways that don’t go through the entire length of the part. Some of the above keyway cutting options, such as broaching and wire EDM, aren’t designed to handle blind keyways. As with some keyseaters, shaping uses a single tooth cutting tool. Unlike keyseaters, shapers aren’t guided down through the cut on a fixed post. As a result, shaper cuts can’t achieve the same level of accuracy as keyseater cuts due to unguided deflection. This increases the need for proper tolerance inspection. In order to cut blind keyways, shapers require users to pre-cut a “relief” at the end of the soon-to-be cut keyway. The relief allows metal chips to break. They can be formed by cutting an internal groove on the inside diameter for hubs or by pre-drilling a hole. Much like shaping, milling allows users to cut partial length, tapered, or straight keyways. Milling is popular for cutting external shaft keyways. However, milling inside diameter keyways on hubs isn’t common because the other side of the coupling gets in the way (with traditional straight milling techniques). But if needed, an internal hub keyway could be milled with a special 90º angular milling head. Like shaping, quality is an important factor to consider when milling keyways (due to lack of unguided cuts). Tolerances, such as corner radius quality, need special attention in order to ensure correct spec. Otherwise, problems could arise such as an imbalance to the power transmission system or a key that doesn’t fit. Ready to Start Keyway Cutting? We hope this guide has given you a clearer understanding of your keyway cutting options. If you’re ready to start keyway cutting, or looking for a way to reduce cycle time and manufacturing cost on your current keyway cutting process, contact us. During our conversation we can discuss which keyway cutting option is best for your application.